Engagement Season will be here in 90 days. Will you be ready? Are you turning off engaged couples? You connect, but then they ghost you. Others find you but never reach out. Learn how to avoid the five critical mistakes that make prospects go somewhere else. You'd rather do weddings than sweat over your website and marketing materials, right? Bring your problems to us! Our wedding marketing experts will give you personalized advice and inspiration. Can't find enough new business? You can never stop looking for your next wedding. Discover six innovative ways to fill your sales funnel with newly engaged couples. Is your sales pitch ready for a remix? Old-school selling techniques don't work like they used to. Learn the secrets of modern selling. Would you like to make some new connections? You'll have the chance to meet some awesome wedding professionals. Bring your business cards. 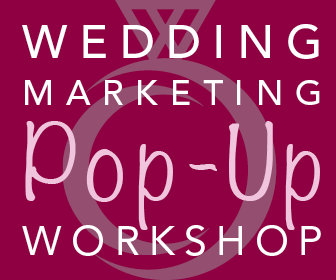 Join us at this fun, fast-paced workshop and be ready to sell when the couples are ready to buy! On each date, we'll have 90 minute small-group sessions at 12pm, 2pm, 4pm, and 6pm. Seats are limited. and to reserve your seat. Everyone who attends will have a chance to win a FREE exhibit booth in the Wedding Experience. Please share this with your industry friends!